Because of security reasons, international laws say which items are and which items are not allowed to be shipped via air transport. Additionally, there are items which can be only transported in the registered baggage and which cannot be taken on board as a part of hand (cabin) baggage. Check maximum size and weight of hand and registered baggage. The rules and regulations regarding transportation of different kinds of items can differ depending on the airline and the passengers’ destination country. The list below is for reference only. 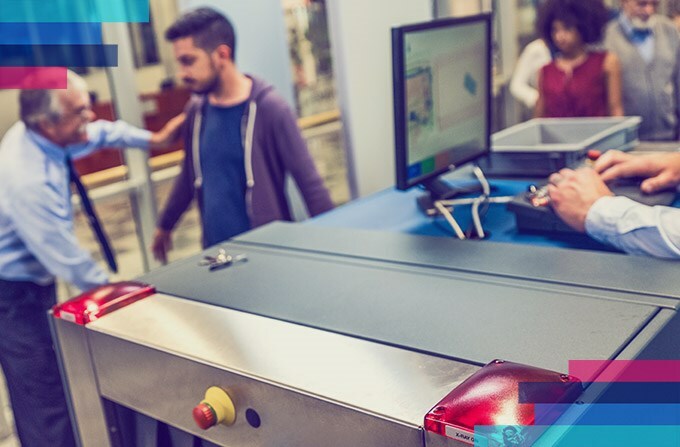 Any airport security officer has the right to demand removal of any item raising doubts, both from hand and registered baggage. What can and what cannot be taken on board? Basic rules apply to the transportation of liquids. A maximum of 1 litre of liquids separated into containers of no more than 100 ml can be taken in hand luggage. This applies to i.e. shampoo, mouth wash, body balms, drinks and alcohol. If you want to take something to drink on board, the best solution is to buy it in the departures lounge, after security check. Items with sharp edges or spikes, which could potentially be used as a weapon, cannot be taken on board in hand luggage either. Medicines and medical accessories which a passenger might need to use when travelling are accepted on board. The details can be found below. * Liquids in hand baggage cannot exceed 100ml each. ** Attention! Eye drops are perceived as necessary medicines. They are allowed to be taken on board provided the container does not exceed 100 ml, however they should be reported separately during the airport security check. *** Liquid prescribed medicines can be taken on board in hand baggage provided the containers do not exceed 100 ml each and they are necessary for the passenger when travelling for medical reasons. They should be reported separately during the airport security check. ** Attention: lack of prohibition of transporting food is valid within the EU borders. Some countries forbid import of unprocessed and fresh foods. E.g. it is not allowed to import most vegetables, fruit, seeds or animal products to the USA or Australia. Such products cannot be imported to EU from outside its borders either. Before your travel make sure if the products you plan on taking with you are allowed. Information about these can be found on official government pages for a given country. ***It is necessary to remember the fact you are only allowed to take up to 1 litre of liquid products in containers not exceeding 100 ml each. Theoretically transportation of alcohol or other drinks is possible, however usually the containers in which the original liquids are sold are bigger, therefore the liquids should be transferred to smaller bottles. Before placing any alcohol in your baggage, check if customs regulations of your destination country, don’t prohibit the import of alcohol. Photographic accessories, e.g. monopod etc. Chargers for mobile phones, laptops, cameras etc. * With a capacity of minimum 100Wh, but not exceeding 160Wh, used for electrical equipment. Walking cane with sharp edges, styled to resemble a hatchet etc. ** Attention! Prescribed medicines are released from the volume limitations and can be taken on board in greater volume (over 100ml) provided they are necessary during the duration of the flight because of medical reasons. Medicines should be reported separately during the airport security check. *** Liquids in hand luggage can be taken on board in containers up to 100ml, however liquid medicines available over the counter, but necessary for the passenger during the flight, are released from the volume limitations. * Attention! The item is to be individually assessed by the airport security staff. ** Limitations regarding maximum baggage size varies by airline. ***** If the airline allows only one piece of hand baggage, the flowers have to fit inside or be the baggage itself.